We now offer a PlayStation 2™ to Xbox 360™ adapter, it requires one of our PlayStation 2 or 5in1 X-Adapters. Our Xbox 360™ ™ adapter will also allow you to use many other PS2 controllers on your Xbox 360™. 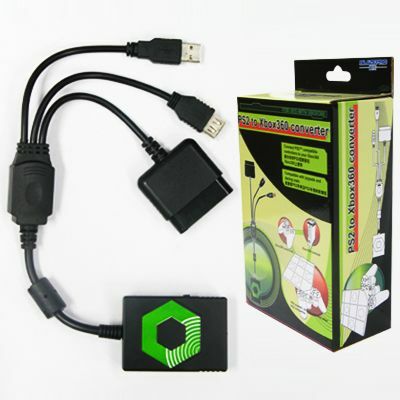 Click here to order an Xbox 360™ adapter for the X-Arcade™. The Trackball is not supported by the 360 X-Adapter™. You may, however, be able to use the trackball in the USB port of your console directly. 4-player: If your console only has 2 USB ports you will need to use a USB hub to connect for 4-players. There is a guide button labeled with an 'X' on the 360 adapter itself. There is a headset jack on it for headsets. To access the Xbox Menu during game play, simply press Back+Start on the X-Arcade. You can also press and hold Back+Start to access the system menu. On gaming consoles, the unit operates just like a standard gamepad with buttons assigned to the arcade buttons. 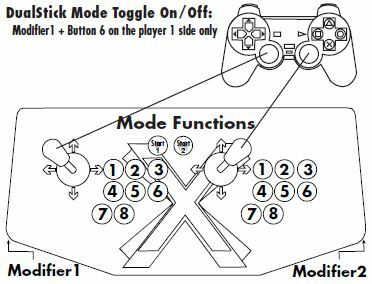 DualStick mode is toggled on and off by pressing the Modifier and Player 1 side button 6 simultaneously, and while in DualStick mode you can still change Joystick 1 between D-PAD and analog thumbstick mode. If the button layout is different from the one above, be sure the switch on the 360 adapter is set to 'Pad', not 'Wheel'. If you have trouble getting both players to work at the same time, try plugging both Xbox 360™ adapters into the USB ports of the console at the same time while the console is already on. The Xbox 360 adapters will only work with the current 5in1 adapter with permanently attached cables. If your 5in1 adapter has detachable cables as shown by number 3 in the diagram above it will not work. If you are still having trouble but your X-Arcade is working on the PC with our test program, try the X-Arcade on a PlayStation 1 or 2 console to see if it works there (if possible). If you have a PlayStation 1 or 2 gamepad, please also test if it works on the 360 adapter. This will help troubleshoot the cause. If you have a new Slim model Xbox 360™ console (smaller one), you may need to use the back USB ports. You MUST use a wired Microsoft® branded Xbox 360™ controller for each player for it to work. A wireless gamepad with Play and Charge™ cable will not work. Guide Button: There is limited support for the Guide button by holding the Back button and pressing X+Start (all 3 buttons simultaneously), but you may need to do this more than once (thanks to Cory Cacioppo for finding this workaround). Otherwise you will need to use a separate gamepad to access the Guide function. Headset: You will need a wireless headset to communicate while gaming. The Xbox 360 adapter also allows you to make the X-Arcade work as an Xinput compatible gamepad instead of a keyboard. It works on PC, Pi, And Nvidia Shield this way.